Hey DC, I got a hot joint for your Friday afternoon listening distraction. It’s great to see a tight-knit crew like the Fort Knox Recordings boys guesting, remixing and performing with each other, creating and maintaining one of the most interesting and cohesive scenes in the last few years. 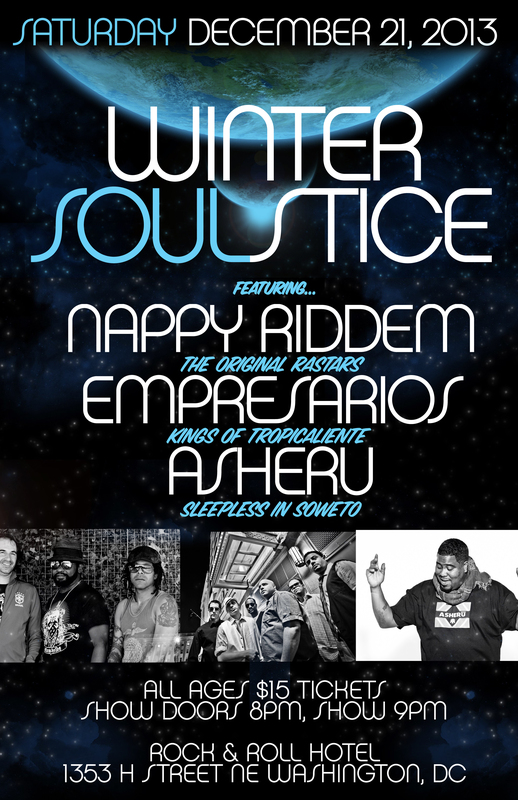 Saturday night H St. NE’s Rock & Roll Hotel hosts The Empresarios, Nappy Riddem and Asheru for a Winter Soulstice Party for the longest night of the year. To get you in the right mood, the Nappy Riddem duo of Rex Riddem and Mustafa Akbar updated Ash’s early 2000’s hit single Mood Swing featuring Talib Kweli into a drum & bass dance floor burner, and you can download and add this remix to your collection for free! Asheru is one of DC’s most underappreciated rappers, though that’s changing with the popularity growing of his full length album Sleepless In Soweto released last month. Tix are only $15, so grab them in advance and guarantee your Saturday night fun!